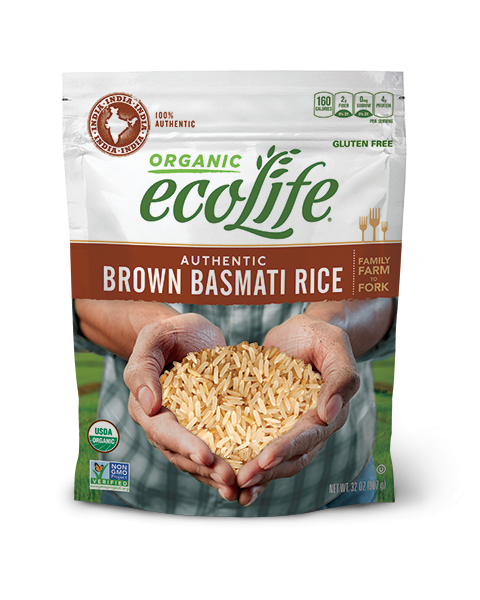 ecoLife® Organic Brown Basmati Rice is a high-quality grain that is cultivated in the Punjab region at the foothills of the Himalayas—the only place where authentic Basmati rice is grown. Nurtured by organic soil, glacial waters and an ideal climate, our rice is an elegant long grain with a fluffy texture and delicately sweet flavor that characterize the finest Basmati. 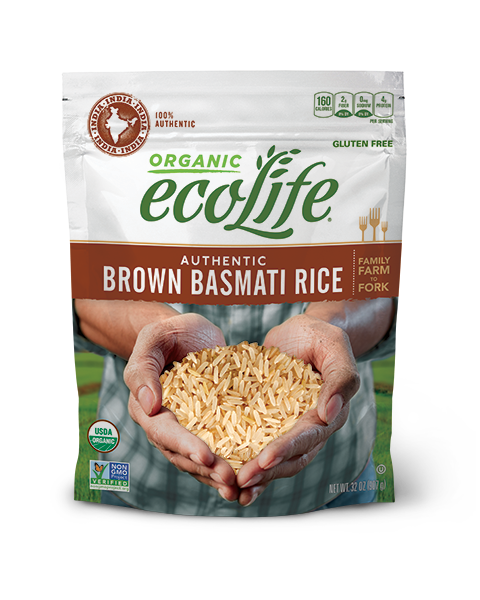 This whole grain rice is nutritious and excellent as a side dish or in salads and stir-fry recipes. If rice is too hard in the first cooking, use more water and increase cooking time. Use less water and reduce cooking time if it is too soft. Bring 2 cups of water to a boil in saucepan with tight-fitting lid. Add 1 cup rice, cover and reduce heat to simmer. Cook for 30 minutes or until water is absorbed. Combine 1 cup of rice with 2¼ cups of water in a microwave-safe tray (2 qts maximum capacity). Cover tightly with microwave-safe lid and cook on HIGH power setting for 16 minutes*. Remove from microwave. CAUTION: BOWL WILL BE HOT. Use ratio: 1 cup dry rice to 2 cups water. See rice cooker manual for specific operation.